Hot flashes. Is there to any more iconic symptom of menopause? More importantly, is there any symptom of menopausethat’smore annoying? Hot flashes can be the “last straw” for many women, convincing them that something has to be done. The good news is that doesn’t need to be drugs. In Chill Out! 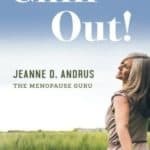 I’ve covered the best of the natural options for controlling and relieving hot flashes, from “in the moment” fixes to long-term solutions. 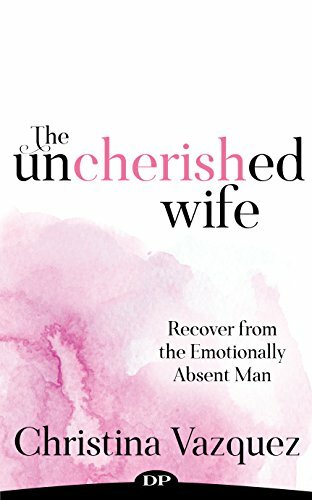 Beginning with the quick fixes, I permit you to figure out how to organize your life to minimize hot flashes and their have an effect on when they do happen. I talk about night sweats and how to get a good night’s sleep by minimizing their occurrence, and then getting back to sleep. Do you need to know why hot flashes happen and whether the drugs and the supplements are actually effective? 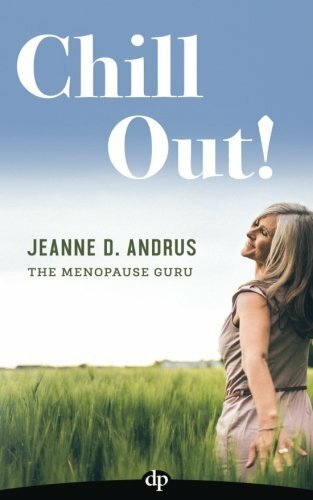 Chill Out!includes explanations about why you’d wish to imagine those options – and why you wouldn’t. I’ve got natural, long-term fixes here, too. We cover the things you’ll change physically and the things you’ll change in the way you approach your life, so that you minimize the hot flashes and maximize your enjoyment of living. 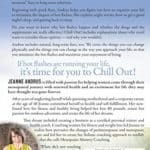 If hot flashes are running your life, it’s time so that you can Chill Out!